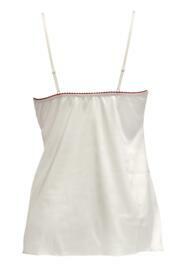 The Pour Moi Mystique Camisole is a versatile little number. In fluid stretch satin and featuring eyelash lace detail to the bust. Finished with delicate bows to the centre front and on the adjustable straps. Ideal for romancing. Beautiful feel and perfect fit. Nice quality camisole , pretty colour and a great fit... good price too.